Victoriana is a historical fantasy steampunk game, set in the Victorian era, written by Walt and published by Cubicle 7 Entertainment. Victoriana is a fantasy steampunk game set in the Victorian era, primarily centered on England. It is very much a historical fantasy setting as time has proceeded much as expected, but events during that time are slightly altered to coincide with Victoriana’s basic canon. The first major change is that all religions within Victoriana have unique names, but draw on equivalent historical religions. The second major change is that humans aren’t the only sapient inhabitants of Earth; there are also Eldren (which are essentially elves), dwarves, gnomes, huldufolk (which are essentially halflings), ogres, orc, and beastfolk (which are essentially anthropomorphic humanoids of various animal design). I’ve always been curious about Victoriana and how the Heresy Engine is designed for it. When it came up on the Bundle of Holding, I jumped at the opportunity to get the whole set. What came in that set was the 3rd edition of the Victoriana core rulebook. Having never seen the 1st or 2nd editions, this review looks at only the 3rd edition and not how it compares to previous core rulebooks. For starters, Victoriana is truly a unique setting experience. Not only is it a fantasy steampunk setting, with more leanings toward technology than magic in the Victorian era, it draws upon its own historical fantasy tropes instead of completely rehashing existing ones. While some are the same or at least similar, these tropes are more tied to the implied history of the setting prior to the Victorian era than they are to any implied “typical” use in a fantasy setting. This experience is only made the more interesting with Victoriana’s class-breeding-function system. However, class doesn’t mean character class, it means social class – Upper, Middle, and Lower. These interrelated functions of the setting help drive character creation along with defining the type of experiences the character has had before choosing the path of adventuring (or whatever it is they decide to do). Overall this is done in an interesting backward method whereas Vocation is defined first, then Social Class, then Breeding (i.e. homosapien subspecies), and finally Attributes and Skills. Granted, the first three provide some definition for the latter two, but there are still additional creation points to provide the freedom of assigning final stats to the character. Thanks to Airship Pirates, I was already familiar with the Heresy Engine before purchasing Victoriana. Needless to say, I like the Heresy Engine dice pool mechanics. Not only for their simplicity, but also because the dice pool has a clean difficulty mechanic. Successes are counted on one colored dice, difficulty is counted on another colored dice. Each success on the difficulty dice negates a success on the regular dice. Simple enough! The one thing I don’t particularly care about the Heresy Engine is the high quantity of skills it employs, but this is more of a personal preference than a fault of the mechanics. I prefer skills that can be easily grouped, but sometimes for setting flavor, it’s preferable to go the other route and break those skills out into their individual uses. Being that skills are grouped into a basic, advanced, and magic category, managing them on a character sheet is not that difficult. Victoriana also employs a very interesting game mechanic that balances chaos and order. There is apparently this eternal power struggle going on whereas chaos and order are being continuously shifted throughout the world to see who can win. However, the true winner is when the world is properly balanced between chaos and order as too much of either one is a bad thing. This is represented on a cog, which really plays to the steampunk aesthetic. I really like this mechanic in terms of balancing magic and technology (on different ends of the power struggle) and ultimately is incorporated into the base mechanics through various bonuses and penalties. I won’t get into those, but you’ll have to take my word that they integrate nicely and make for an interesting mechanical representation of the fantasy steampunk theme. 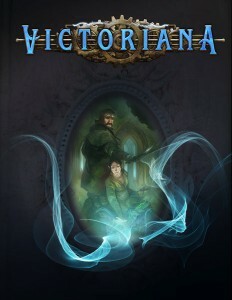 Going into Victoriana, I already knew the setting was historical fantasy based in the Victorian era. Combined with this was steampunk technology that previously wasn’t as prominent as it has now become. Thus I classify the setting as historical fantasy steampunk. During one of my trips to Gen Con, right before 3rd edition came out, I spoke to the crew at Cubicle 7 to find out what was different with the upcoming new edition. One of the comments was that people were confused on whether or not the setting was historical fantasy, steampunk, fantasy steampunk, or gothic horror, which is often common to the Victorian era. The answer I got was that it’s all of them and whichever one you want at the same time. The result is that all of those elements have been incorporated into the setting, but not always in a particularly smooth fashion. In fact, the supposed gothic horror aspects of the setting do not come out clearly at all until they’re smacked into your face in a section that claims “Victoriana is a horrific setting”, or something like that. It didn’t seem horrific at all to me until that statement was made, but that ultimately doesn’t matter to me as they do provide text and bestiary that supports that, albeit not as much as it supports the other elements of the setting. A better way of describing the setting is that you have elements of history, fantasy, steampunk, action and adventure, and gothic horror all rolled into one package. GMs can then pick and choose which elements they want to incorporate without breaking the setting. Overall, I really like Victoriana and I think it’s a well-built system with an interesting setting. The horror aspects don’t seem as ingrained in the setting as the historical fantasy and steampunk aspects do, but it’s easy enough to add those in. You’re not really going to get that gothic horror experience like you might think; the setting may be ominous, but fear isn’t an integral part of it. It’s more like necromantic or occult fantasy than gothic horror; the aesthetics of such are much more present than actual gothic horror ones. However, if you’re looking for that Victorian fantasy steampunk style, there’s really no need to look any further!